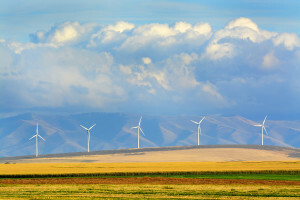 Appalachian Power Company (“APCo”), which provides electric service in western Virginia and southern West Virginia, has received regulatory approval in Virginia and West Virginia to add approximately 120 MW of wind energy to its generation portfolio. APCo sought approval from its regulators in both states to purchase the wind energy from NextEra Energy Resources, which will build the wind facility in Indiana. The Bluff Point wind farm is expected to be online by 2018 and will help APCo meet its voluntary renewable portfolio standard goal in Virginia. APCo and Dominion Virginia Power both have a goal of using 15% renewable energy (based on each utility’s 2007 sales) by 2025. The Virginia State Corporation Commission (“SCC”) approved the Bluff Point wind contract following a settlement between APCo and the SCC’s Staff. The settlement was approved despite opposition from a group of large industrial customers of APCo. The industrial group objected to a proposal by APCo that will provide rate credits to commercial and residential customers during periods when wind power costs are less than prevailing market prices for energy. Under Virginia law, industrial customers are not allocated expenses that utilities incur to attain their renewable portfolio standard goals. The Bluff Point PPA was also approved by the West Virginia Public Service Commission following a settlement among the parties. APCo’s president, Chris Beam, recently stated publicly that the utility expects to add new wind resources in southern West Virginia in the near future. Currently, APCo’s generation portfolio consists of about 60% coal resources. APCo will file its 2017 Integrated Resource Plan, describing the company’s planned investments in new renewable generation over the next 15 years, with the SCC on May 1. If you have questions about this regulatory ruling or renewable energy development in Virginia or the mid-Atlantic, please contact one of our renewable energy lawyers.